1797: he makes his first appearance on stage, receiving the name of Ichikawa Santarô. 1801: Santarô is adopted by Matsumoto Kôshirô V.
11th lunar month of 1801: great shûmei at the Ichimuraza for the Kôraiya guild; Matsumoto Kôshirô IV, his son Ichikawa Komazô III and Ichikawa Santarô respectively take the names of Omegawa Kyôjûrô, Matsumoto Kôshirô V and Ichikawa Komazô IV. They play together in the kaomise drama "Otoko Narikeri Onna Masakado". 1810: quarrel with Matsumoto Kôshirô V; Ichikawa Komazô IV leaves the Matsumoto clan and takes the name of Ichikawa Shinzô III. 3rd lunar month of 1814: premiere at the Ichimuraza of Tsuruya Nanboku IV's drama "Sumidagawa Hana no Goshozome", commonly called "Onna Seigen"; Shinzô plays the role of Arakawa Kijirô [more details]. 9th lunar month of 1819: his father Nakayama Tomisaburô I dies. Fall 1820 ~ Summer 1822: tour in Nagoya and first long stay in Ôsaka. 6th lunar month of 1821: Katsu Hyôzô I's drama "Kachi Zumô Ukina no Hanabure", commonly called "Shirafuji Genta", is revived for the first time, 11 years and 3 months after its premiere in Edo, in Kyôto at the Kitagawa no Shibai; Shinzô plays the role of Tsugawa Katsujirô [casting]. 9th lunar month of 1822: Shinzô goes back to Edo and takes the name of Nakayama Tomisaburô II at the Kawarasakiza, playing in the drama "Gozonji Azuma no Kara". 11th lunar month of 1822: Nakayama Tomisaburô II takes the name of Nakayama Kinsha at the Ichimuraza, playing the role of Katô Saburozaemon in the drama "Gohiiki Tsuwamono no Majiwari". 3rd lunar month of 1823: premiere at the Ichimuraza of Tsuruya Nanboku IV's drama "Ukiyogara Hiyoku no Inazuma"; Kinsha plays the role of Rokkaku Sakyônoshin [casting]. 11th lunar month of 1823: Nakayama Kinsha takes back the name of Nakayama Tomisaburô II at the Ichimuraza, playing in the kaomise drama "Yama Mata Yama Hana no Yamagatsu", which celebrates the shûmei of Osagawa Tsuneyo IV and Yamashina Jinkichi IV. 1829 ~ Summer 1830: second stay in Ôsaka. 8th lunar month of 1830: Tomisaburô goes back to Edo; he becomes disciple of the actor Ichikawa Ebizô V and takes the name of Ichikawa Sumizô III at the Kawarasakiza, playing the roles of Hayagawa Takakage and Sasaki Samanosuke in the drama "Ichikawa Yamasago no Gohiiki". 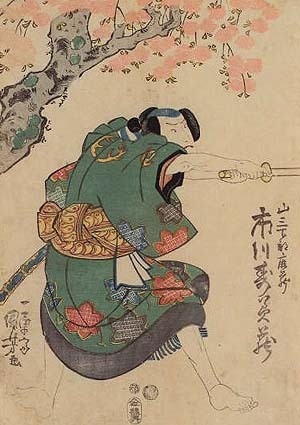 4th lunar month of 1836: premiere at the Moritaza of the drama "Hakkenden Uwasa no Takadono"; Sumizô plays the roles of Yamashita Sakuzaemon Sadakane, Yokobori Arimura, Ônuma hachirô, Hikiroku, Inukawa Sôsuke, Akaiwa Ikkaku, Inugawa Sôsuke, Ikkaku's wife Funamushi and the monk Kokuunbô [casting]. 9th lunar month of 1836: Sumizô appears on stage for the last time, at the Nakamuraza, playing the role of Kameômaru in the drama "Hime Komatsu Ne-no-Hi no Asobi". Ichikawa Sumizô III was a talented supporting actor, able to play either tachiyaku or katakiyaku roles, equally at home in jidaimono or sewamono dramas. He died before becoming a popular actor.